Valley of the Gods is a very remote desert site in Southern Utah near Monument Valley. Here in the desert solitude, the stars shine with a brilliance you can only find in the West. Miles away from any city lights, Valley of the Gods is one of the darkest sites I have ever experienced. The glow from the Milky Way is so brilliant that you can see the three dimensional shape of our galaxy. 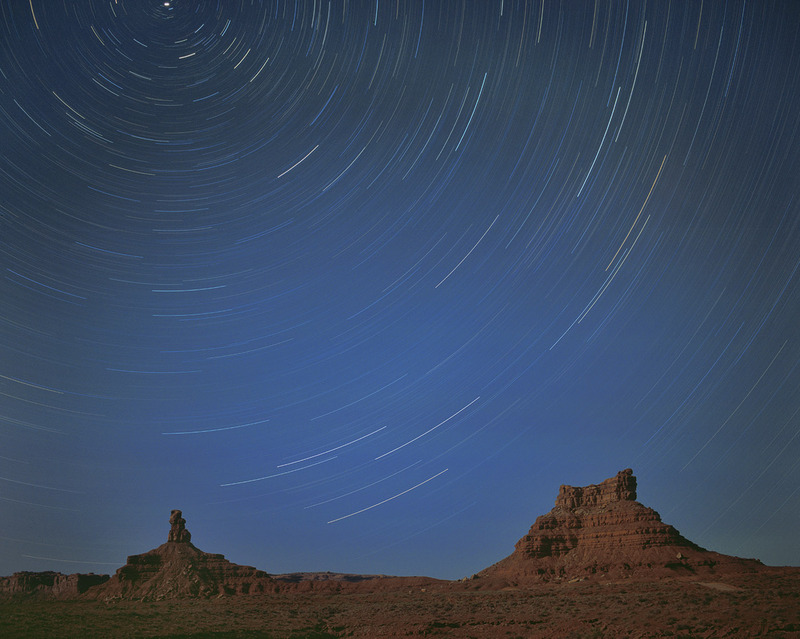 This star trail photograph was taken with a medium format camera on a tripod. The distant buttes were illuminated by a crescent moon setting in the west. The shutter exposure was set to B and the shutter was locked open for 45 minutes. Location: Valley of the Gods, Southern Utah.